Oil Pan Seal -DIY question. I have a 03 Honda Accord EX couple, any one know of a tutorial of how to remove the oil pan. I read my Haynes manual but there is talk of removing a great deal of stuff just to get to it. Has anyone done this before this seem like something me and my hand tools could do on a Saturday morning in the garage. I found on walkthru online but the photo were all messed up. The dealer told me $600 dollars but I think me and my torque wrench can take care of this job? Last edited by vwtech; 06-13-2016 at 03:06 PM. Are we working on a 4 or 6 cyl engine....auto or manual trans will help with some of the "fine" details as well. It's a 03 Honda Accord EX couple 4cyl Manual. 4 cyl, manual not too bad. The left/drivers side cv comes out and pretty much from there it is drop and replace. 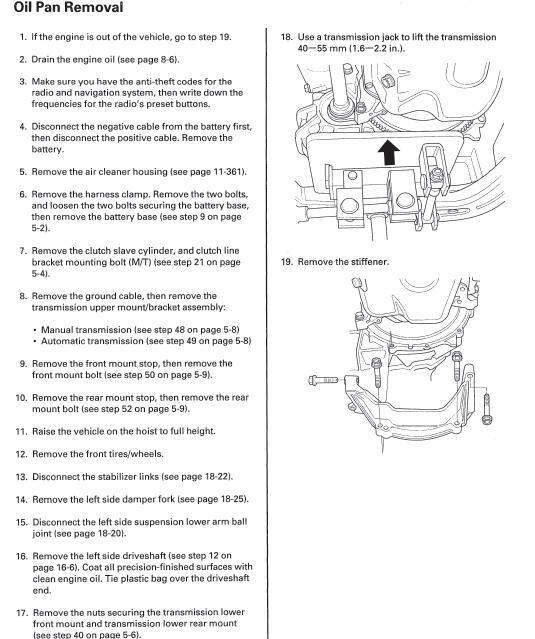 For $22~$27 you can buy a factory service manual from "automanualsource (dot) com". It will have the steps ans spec's you need. About two months ago, I lifted the front of the car with the wheels off. And removed the stiffer (thought I was going to lose all the manual transmission fluid so I drained it first). At this point I could get to all the bolts but couldn't tell if I'd have enough clearance to get it out so I left it alone and put everything back together (torqued to spec) and refilled transmission with Honda MTF. Guess my question on this is if the transmission has to be lifted in order to get the pan out? I just don't see why I have to raise the transmission to do this task. Going off my memory of the quick read I did the other noght, I think you are only rasing it to loosen one of the mounts that will then allow you to lower the engine/trans for enough clearance to get the pan out.. The problem was the timing chain cover seal and the crank seal. Had them repair it some months back and haven't had any oil leaks since. *However; I wish there was a garage how-to on replacing the oil pan seal. Quick Reply: Oil Pan Seal -DIY question.